Support. Markings on highways have important functions in providing guidance and information for the road user. Major marking types include pavement and curb markings, delineators, colored pavements, channelizing devices and islands. In some cases, markings are used to supplement other traffic control devices such as signs, signals and other markings. In other instances, markings are used alone to effectively convey regulations, guidance, or warnings in ways not obtainable by the use of other devices. Markings have limitations. Visibility of the markings can be limited by snow, debris, and water on or adjacent to the markings. Marking durability is affected by material characteristics, traffic volumes, weather, and location. However, under most highway conditions, markings provide important information while allowing minimal diversion of attention from the roadway. Pavement markings can enhance roadway delineation with the addition of audible and tactile features such as bars, differential surface profiles, milled rumble strips, or other devices intended to alert the road user that a delineation on the roadway is being traversed. Standard. Traffic control devices within the right of way will be placed and maintained by the Missouri Department of Transportation in accordance with Sections 226.010 and 227.220 of the Revised Statutes of the State of Missouri. Pavement, curbs and other additionally approved markings on state roadways shall be placed only by the authority of the Missouri Highway and Transportation Commission. Delineators and markings on objects warning of their close proximity within the roadway right-of-way are subject to the same jurisdictional regulations. Support. Traffic control on roads not maintained by MoDOT but are signed as a state route should meet the requirements of this article. Future maintenance agreements should reflect these requirements. Standard. Each standard marking shall be used only to convey the meaning prescribed for that marking in EPG 620. When used for applications not described in EPG 620, markings shall conform in all respects to the principles and standards set forth in EPG 620. Guidance. Before any new highway, private road open to public travel, paved detour, or temporary route is opened to public travel, all necessary markings should be in place. Standard. All markings on MoDOT highways shall be retroreflective. Markings that are no longer applicable for roadway conditions or restrictions and that might cause confusion for the road user shall be removed or obliterated to be unidentifiable as a marking as soon as practical. No guidance at this time. Support. Pavement and curb markings are commonly placed by using paints; however, other suitable marking materials, including raised pavement markers and colored pavements, are also used. Delineators and channelizing devices are visibly placed in a vertical position similar to signs above the roadway. Guidance. The materials used for markings should provide the specified color throughout their useful life. Consideration should be given to selecting pavement marking materials that will minimize tripping or loss of traction for pedestrians, bicyclists and motorcyclists. Delineators should not present a vertical or horizontal clearance obstacle for pedestrians. A. Waterborne Paint. This material is the standard paint used by contractors and MoDOT forces. MoDOT forces use waterborne for all long line applications, while contracts should specify it on minor routes. Waterborne paint may be applied at a wet thickness of 20 mils or less. It may also be used for intersection markings when the life of the pavement is not expected to outlast a more durable product (see Preformed Pavement Marking Tape). See EPG 620.11 Guidelines for Using Water-Borne Traffic Paint. B. High Build Waterborne Paint. High Build paint can be applied in a thicker layer than waterborne paint and it is used by contractors when specified. High build paint may be applied at a wet thickness of up to 30 mils. High Build is one of two options for material to be used in contractor installations on divided highways. See EPG 620.11 Guidelines for Using Water-Borne Traffic Paint. C. Epoxy. Epoxy pavement marking is a two-component epoxy resin and amine curing agent material. Epoxy is used only on major roads, when specified. Epoxy is applied at a wet thickness of up to 30 mils. Curing time for epoxy under optimum conditions is approximately 10 minutes. Channelizers can be used to protect the marking during the cure period. Epoxy is the second option for material to be used in contractor installations on divided highways . Epoxy pavement marking for lane lines is installed in a groove. Grooving is an additional pay item. Shall be applied as per manufacturer’s recommendation. D. Cold weather paint. This material is used in special situations when specified. Cold weather paint is a water-based material that can be used at lower temperatures. Cold weather paint is normally applied at a wet thickness of 15 mils. See EPG 620.11 Guidelines for Using Water-Borne Traffic Paint. E. Durable Intersection Marking Materials. Due to the excessive wear experienced in and around intersections, durable marking materials (preformed thermoplastic, cold applied tapes, extruded / sprayed thermoplastic or plural component liquid) should be used to mark intersection markings (stop bars, yield bars, arrows, words, symbols, hash bars, shields, etc.) . These materials will remain in place longer and reduce maintenance requirements. F. Temporary Removable Pavement Marking Tape. Temporary removable tape is used to delineate traffic lanes during construction. Preformed removable tape does not require special equipment to install or remove, however material costs are high, so it may only be cost effective in small quantities. The primary advantage is that the removal of this tape is inexpensive and will not scar the pavement. The primary disadvantages of tape are the higher material cost and weather constraints for installation. When establishing contract times and milestones, the potential timing of paving activities and weather constraints should be considered when selecting temporary pavement marking. A pay item for removal of the marking tape will be included if removal is required. Shall be applied as per manufacturer’s recommendation. G. Temporary Pavement Marking Tape. Temporary pavement marking tape is used in locations where the marking will be in place no more than two weeks. It is cost effective only in small quantities. Short-term pavement marking is not normally removed. If removal is required, removable tape is the preferred material. Short term marking should not be used for temporary lane transitions or bypasses. Shall be applied as per manufacturer’s recommendation. H. Temporary Raised Pavement Markers. Temporary raised pavement markers are used on contract leveling course and resurfacing projects on two or three lane roadways with no passing zone center striping to provide a temporary centerline until permanent marking is replaced. Temporary raised pavement markers are used in combination with the NO CENTER LINE sign. Temporary markers should also be used to provide a temporary lane line on 2-lane roadways with climbing lanes. Temporary markers may also be used to supplement other pavement marking in areas where emphasis is needed, such as on bypasses and lane transitions. Markers dividing two lanes of traffic in the same direction have one reflective face that is white in color. The edgeline markers with two lanes of traffic in the same direction are yellow for the left edgeline and white for the right edgeline. Markers dividing two lanes of traffic in opposite directions have two opposing reflective faces that are yellow in color. The edge line markers with two lanes in opposite directions are white. See Standard Plan 620.10 for details on using temporary raised pavement markers. Temporary raised pavement markers are used primarily on pavement surface treatment projects. Surface treatment is defined as any pavement surfacing as defined in Sec 413 of the Standard Specifications. Type 1 markers are used for temporary edgeline marking and as part of the "cluster" marking of temporary lane lines. Temporary raised pavement markers do require removal after the permanent marking is in place. They do not require a pay item for removal. I. Snowplowable Raised Pavement Markers. Snowplowable raised pavement markers (SRPMs) consist of an iron casting to which is attached a replaceable prismatic retroreflector for reflecting light longitudinally along the pavement from either one or two directions as specified. MoDOT no longer installs any new SRPMs. Standard. SRPMs are neither being installed new nor reinstalled on any more projects. If the district chooses to leave the SRPM’s in place, both the reflectors and the shoes shall be maintained. The districts must assure SRPMs that remain in the pavement are regularly inspected. Where cold milling is being done, the removal of the SRPMs is included in the cost of cold milling. On surface treatment and resurfacing projects SRPMs shall be removed before application of the surface treatment or resurfacing. SRPMs shall not be left in place and covered by surface treatment or resurfacing. Support. The night visibility of pavement markings is a direct result of the presence and quantity of the spherical glass or ceramic "beads" that are embedded in the pavement marking material. There are several types of beads used by MoDOT. A. Type PM Beads. These are an intermediate blend of glass beads. These beads are used by MoDOT striping forces on all roads except divided highways. The "PM" stands for performance maintenance. B. Type P Beads. These are the variation of the type PM beads used by contractors (see Sec 1048.40). The "P" stands for performance. C. Type L Beads. These are a “large” glass bead. These beads are used by MoDOT striping forces and contractors on divided highways. Guidance. MoDOT forces typically apply beads to the wet paint at the rate shown in the above chart. On contractor applied pavement markings, the glass beads are applied at a rate determined by the contractor to meet the minimum retroreflectivity requirements of the contract. The bead guns on the stripers should be calibrated frequently to assure the proper application rate of beads is being applied to the painted line. The frequency of these calibrations is dependent on the bead guns and their ability to maintain a constant flow of beads. The calibration should be accomplished using an appropriate bead calibration kit. These kits contain a table to calculate the appropriate flow of beads for a given speed of the striper. This calibration should be performed a minimum of once every week of operation. Spot checks should be performed using two methods. The first method is accomplished with the aid of an aluminum sign panel placed ahead of the striper on which the paint, without beads, is to be applied and a mil thickness gauge used to read the wet paint mil thickness. The bead application rate should also be checked at this time by measuring the volume of beads being dispensed over a given time period. These methods should be used to calibrate the striper at the beginning of each day. The second method involves checking the amount of material used, both paint and beads, versus the miles marked. This method should be used throughout the remainder of the day to verify the proper material application rates are being maintained. Wet reflective markings are no longer used by MoDOT. Guidance. Contrast marking should be used to enhance the visibility of white markings on concrete pavements. On either new concrete surfaces or diamond grinding projects, lane lines should include contrast markings. Contrast markings consist of standard white markings with an additional width of black marking on each side. Contrast markings should be maintained until the pavement ages or greys so that normal markings are adequate. Standard. Markings shall be yellow, white, red, blue or purple. The colors for markings shall conform to the standard highway colors. Black in conjunction with one of the colors listed in the first sentence of this paragraph shall be a usable color. A. The separation of traffic flows in the same direction. B. The right-hand edge of the roadway. D. Approaches to obstructions that may be passed on either side. I. Islands that may be passed on either side. J. Curbs and wall (right side of roadway). A. The separation of traffic traveling in opposite directions. 1. No passing zones on two or three lane roads. 3. Approaches to obstruction that must be passed on the right. 4. Approaches to railroad crossings. 5. Approaches to STOP signs. B. The left-hand edge of the roadways of divided highways and one-way streets or ramps. C. The separation of two-way left turn lanes and reversible lanes from other lanes. D. Islands that must be passed only on the right. E. Curbs and walls (left side of roadway). When used, red pavement markers or delineators shall delineate one-way roadways, ramps or travel lanes that shall not be entered or used in the direction from which the markings are visible. When used, blue markings shall supplement white markings for parking spaces for persons with disabilities. When used, purple markings shall supplement lane lines or edge line markings for toll plaza approach lanes that are restricted to use only by vehicles with registered electronic toll collection accounts. Option. Colors for official route shield signs may be used as colors of symbol markings to simulate route shields on the pavement. Refer to EPG 620.2.20. Black may be used in combination with the colors listed in the first sentence of EPG 620.1.5, Standard where a light-colored pavement does not provide sufficient contrast with the markings. Support. When used in combination with other colors, black is not considered a marking color, but only a contrast-enhancing system for the markings. D.	A dotted line provides guidance or warning of a downstream change in lane function. 1. Major routes: all white lines – 6 in. wide, yellow edgelines – 6 in. wide, yellow centerline markings (including no passing zone markings) – 4 in. wide. 2. Minor routes: white edgelines – 4 in. wide, all yellow center line markings (including no passing zone markings) – 4 in. wide. B. A wide line is at least twice the width of a normal line. C. Double line: two parallel lines separated by a discernible space. D. Broken line: normal line segments separated by gaps. E. Dotted line: noticeably shorter line segments separated by shorter gaps than used for a broken line. The width of a dotted line extension shall be at least the same as the width of the line it extends. Broken lines shall consist of 10 ft. line segments and 30 ft. gaps. A broken line shall be used to delineate two adjacent lanes of traffic where crossing the line with caution is permitted. A normal broken white line shall be used delineate the edge of travel path where travel is permitted in the same direction on both sides of the line. Its most frequent application is as a lane line of a multi-lane roadway. A normal broken yellow line shall be used to delineate the left edge of a travel path where travel on the other side of the line is the opposite direction. A frequent application is a centerline of a two lane, two-way roadway where overtaking and passing is permitted with due care and caution. A double normal broken line shall delineate the edge of a lane in which the direction of travel is changed from time to time, such as reversible lanes. Solid lines shall be used to delineate two adjacent lanes of traffic where crossing the line is discouraged, as well as being used mark the edge of the pavement. A solid white line shall be used delineate adjacent lanes of traffic traveling in the same direction where crossing the line is discouraged. A frequent application is a lane line approaching an intersection, right edge line or gore areas at exit ramps. A solid yellow line shall be used as a guide or regulatory line to the left of which it is unsafe or illegal to travel. Where a combination solid and broken lines are used, the solid yellow or barrier line has significance only if it is on the right-hand side of this combination as viewed by the driver (i.e. in or adjacent to the traffic lane to which it applies). A solid line shall also be used to mark the left edge line such as on a ramp. Support. The width of the line indicates the degree of emphasis. Patterns for dotted lines depend on the application. Refer to EPG 620.2.4 White Lane Line Pavement Markings and Warrants and EPG 620.2.8 Extensions Through Intersections or Interchanges. Guidance. A dotted line for line extensions within an intersection or taper area should consist of 2 ft. line segments and 2 ft. to 6 ft. gaps. A dotted line used as a lane line should consist of 3 ft. line segments and 9 ft. gaps. Select permanent pavement markings based upon the Pavement Marking Guidelines table. The selection of permanent pavement markings shall be based on the Pavement Marking Guidelines table. Support. Contract work consists of furnishing and installing durable intersection markings, cold weather paint, high build waterborne paint, waterborne pavement marking, or epoxy. Standard. On the final lift of resurfacing projects and on all new pavements, all pavement marking will be provided by contract. On surface treatment projects, all pavement marking will be provided by MoDOT. Standard. All permanent marking materials shall be installed in accordance with the manufacture's recommendations. Durable pavement markings, such as epoxy, used for lane lines shall be installed in a groove. Guidance. For road segments with different pavement types less than 1,000 ft. long, such as a concrete bridge deck surrounded by asphalt, the pavement marking type for the surrounding pavement should be continued through the segment and contrast marking would not be required on the bridge deck. Support. Temporary pavement marking consists of furnishing, installing, and maintaining pavement marking in work zones. Standard Plan 620.10 shows layouts for typical situations. Paint requires special equipment to install and remove, however material costs are low, so it is cost effective to install in large quantities. The advantage of paint is it can be installed faster than other types of pavement marking material. This is an advantage where striping must be placed under traffic. The primary disadvantage is that the removal of paint is expensive and will result in scarring of the pavement. A pay item for removal of paint will be included if removal is required. Preformed removable marking tape is the preferred temporary pavement marking material on final wearing surfaces. Preformed removable tape is used to delineate traffic lanes during construction as described above under pavement marking paint. Preformed removable tape does not require special equipment to install or remove, however material costs are high, so it may only be cost effective in small quantities. The primary advantage is the removal of this tape is inexpensive and will not scar the pavement. The primary disadvantages of tape are the higher material cost and weather constraints for installation. A pay item for removal of the marking tape will be included if removal is required. Short-term pavement marking tape is used in locations where the marking will be in place no more than two weeks. It is cost effective only in small quantities. Short-term pavement marking is not normally removed. If removal is required, removable tape is the preferred material. Temporary raised pavement markers are used on contract leveling course and resurfacing projects on two or three lane roadways with no passing zone center striping to provide a temporary centerline until permanent marking is replaced. Temporary raised pavement markers are used in combination with the No Center Stripe sign described in Work Zone Signing. Markers dividing two lanes of traffic in the same direction have one reflective face that is white in color. Markers dividing two lanes of traffic in opposite directions have two opposing reflective faces that are yellow in color. Edge line markers are yellow for the left edge line and white for the right edge line. Where markers are used to emphasize edge lines in sharp curves or tapers, recommended spacing is 15 feet. Where they are used to emphasize intermittent lines or solid lines in tangent sections, recommended spacing is 40 feet. Other spacing may be used according to conditions see Raised Pavement Markers (MUTCD Section 3B.11). Option. Temporary marking tape may be used to establish experimental lanes or intersection markings to determine the markings effectiveness prior to installing the permanent markings. It may also be used to mark temporary centerlines following spot sealing and patching operations. Temporary pavement marking may be used as a short term replacement for existing marking for grinding, milling and resurfacing, but no direct payment is made to the contractor as described in Standard Specification Section 620. Waterborne or cold weather paint may be used on temporary bypasses or any pavement that will be removed at the end of the project or on pavements where resurfacing will cover the striping. Paint may also be used to delineate temporary traffic lanes where the pavement markings are not in their final locations, such as lane shifts during stage construction, however the removal of paint will result in scarring of the pavement. These factors are to be considered before the decision is made to use temporary paint on final wearing surfaces. Temporary raised pavement markers may also be used to supplement other pavement marking in areas where emphasis is needed, such as on bypasses and lane transitions. Guidance. Temporary marking should be used with pay items where the traffic pattern has changed during construction due to bypasses, lane shifts, narrow lanes, etc. When establishing contract times and milestones, the potential timing of paving activities and weather constraints should be considered when selecting temporary pavement marking. Short term marking should not be used for temporary lane transitions or bypasses. Temporary raised pavement markers are used to provide temporary guidance until the permanent pavement markings can be applied in 14 days or less. If temporary pavement marking must remain in place longer than 14 days then a temporary paint should be used to supply guidance to motorist. If temporary paint is used, it shall be applied in the same location and patterns as the permanent pavement marking will be applied. Temporary raised pavement markers do require removal and proper disposal. They do not require a pay item for removal. This material should not be recommended for locations where it will be subject to heavy traffic for periods greater than 2 months, in areas of heavy turning movements or on short radius curves. In addition, it should not be used to provide pavement marking following completion of construction projects. Support. In order to preserve the appearance of our highways, it is requested that marking on the roadway, for other than traffic regulations, be held to a minimum. These markings are considered detrimental to the traveling public and an unsightly marring of the roadway. Standard. All unauthorized pavement markings shall be removed as soon as the district's time schedule will permit. Standard. 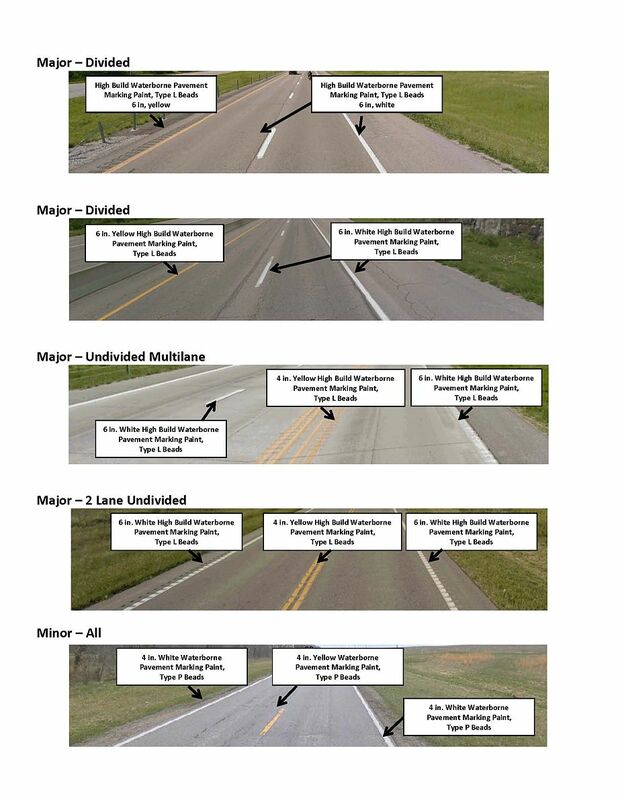 Striping by MoDOT forces shall include the application of a double yellow centerline on state park roads that are a direct extension of a striped state route into the park and that have a surface width of at least 16 feet. This stripe shall continue to a reasonable and logical conclusion within the park. These operations shall be performed when MoDOT forces are working in the area. Initial marking of state park roads shall only be done after a request has been received in writing from the Department of Natural Resources, State Parks Division. All other striping performed by the department shall be confined to the Missouri Department Of Transportation System. Striping beyond the system for unusual and unique circumstances shall require prior approval by the District Engineer. Type PM Beads 10 lbs/100 sq. ft. Type L Beads 15 lbs/100 sq. ft.
Option. Heat may be applied to the paint to maintain a uniform viscosity. Guidance. Water borne paint should not be heated above 100 degrees Fahrenheit(Refer to Guidelines for Using Waterborne Traffic Paint for the application of water borne paint). During marginal weather conditions at the end of the striping season, in November and December, cold weather paint should be used. Guidance. All pavement markings should be replaced when they are determined to be unacceptable. Pavement markings must look good during the day and at night. Divided highways should be striped using Type L beads to provide wet night recovery. Standard. Day performance is defined as 95 percent of the markings shall not appear damaged or missing to the driver at a distance of 150 ft. from the vehicle. Night performance is defined by the retroreflectivity of the markings. Guidance. - The retroreflectivity inspection should be performed on a section of roadway with a constant grade, no overhead lighting, sitting in the travel lane and measuring the length of marking visible with the high beams of the vehicle on. A line is considered satisfactory if it is visible for a minimum of 200 ft. or 5 lane line skips ahead of the vehicle. Retroreflectivity can also be measured with retroreflectometers. If handheld retroreflectometers are used, the Guidelines for Measurement of Retroreflectivity by Handheld Retroreflectometers should be used. Standard. Standard. Pavement markings on major roads shall be replaced annually unless the markings meet the performance levels for new pavement markings (see Pavement Marking Acceptance Table). Standard. Pavement markings on minor roads that are designated regionally significant shall be replaced annually, unless the markings meet the performance levels for new pavement markings (see Pavement Marking Acceptance Table). Only 50 percent of the remaining minor roads with an AADT greater than or equal to 400, which are not regionally significant will be striped in a year. Included in this 50 percent are any roads that receive surface treatment. Minor roads with an AADT less than 400 should only be striped once every three years (unless it receives a surface treatment). Option. The level of retroreflectivity may be determined visually at night. Support. The goal of the department policy is to provide a uniform line, which will command the respect of the traveling public. This will require the matching of the previous year's stripe. This degree of quality can be maintained with our present equipment; however, as is the case in any operation, the striping crew will be the main element in achieving a neat, uniform line. Standard. At the end of the construction season, MoDOT shall ensure that adequate pavement marking is in place during the winter months on incomplete construction resurfacing projects. The markings required shall provide the appropriate traffic control for the given situation while meeting the guidelines of EPG 620. If required, a stripe shall be marked on new asphalt type surfaces, or existing old pavement, and will be applied using normal application rates. It shall be the responsibility of the contractor to apply this material to ensure adequate pavement markings are provided during the winter months for the traveling public. Refer to the Pavement Marking Guidelines table for guidance on materials and applications. This work consists of removing all existing or temporary pavement marking which is conflicting or might mislead traffic. The exception is short term marking tape which should be in place two weeks or less. During the process of detouring traffic around construction and maintenance areas and incorporating changes in traffic movements, it may be necessary to remove or obliterate inappropriate pavement markings on the roadway. If this is not done properly the original markings can misdirect traffic, resulting in possible conflicts for both motorists and workers. Standard. The use of asphalt or black paint to cover conflicting markings shall not be allowed. All removal methods must comply with EPA and MDNR regulations concerning air quality and material disposal. Guidance. Provisions should be made on the TCP for the removal of all conflicting or misleading markings. Pay items should be provided for removal of pavement marking when required. 1. Mechanical devices, such as grinders, sanders, scrapers, wire brushes or shot blasters. 2. High temperature burning with excess oxygen. Where pavement markings have been obliterated, nighttime inspections should be made to verify that the marking is no longer visible and does not interfere with the new pavement markings. Options. Where mechanical means of marking removal have been employed to completely remove the pavement marking, paint of a color matching the pavement surface or liquid asphalt materials may be used as a temporary means of covering contrasting pavement texture. This page was last modified on 27 December 2018, at 13:09.